If your commute to work or home can sometimes be congested with traffic, you may be interested in a new do you know hack which has been published by the team who created the awesome 1Sheeld system. Which allows you to visually see how congested the roads are from your location to your home or office. 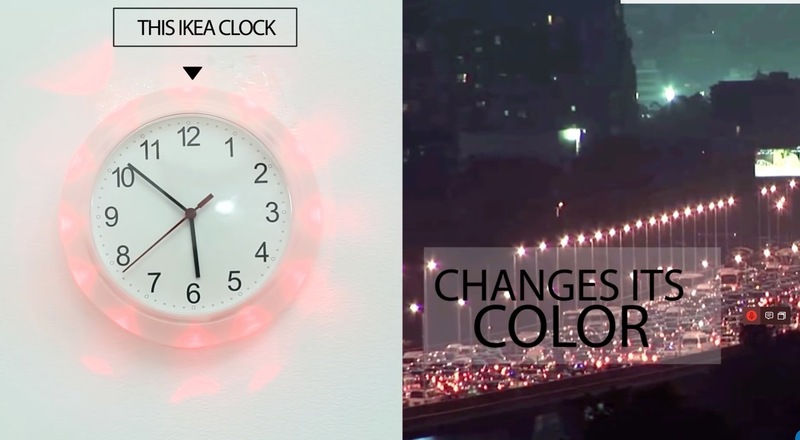 Watch the video below to learn how and affordable IKEA clock has been transformed into a visual traffic monitor using a couple of LEDs and a little Arduino programming. When the traffic is particularly bad on your desired route the clock will glow red. When traffic congestion is minimal on the same route the clock will glow green. Using the 1Sheeld and Arduino, I can access the internet and check the traffic time duration (every 5 minutes) to my home and glow the clock green if traffic is clear, or red if is horrible  Let’s check out the steps to know how to do it yourself! Jump over to the 1Sheeld website for full instructions and a full list of all the components you will need.